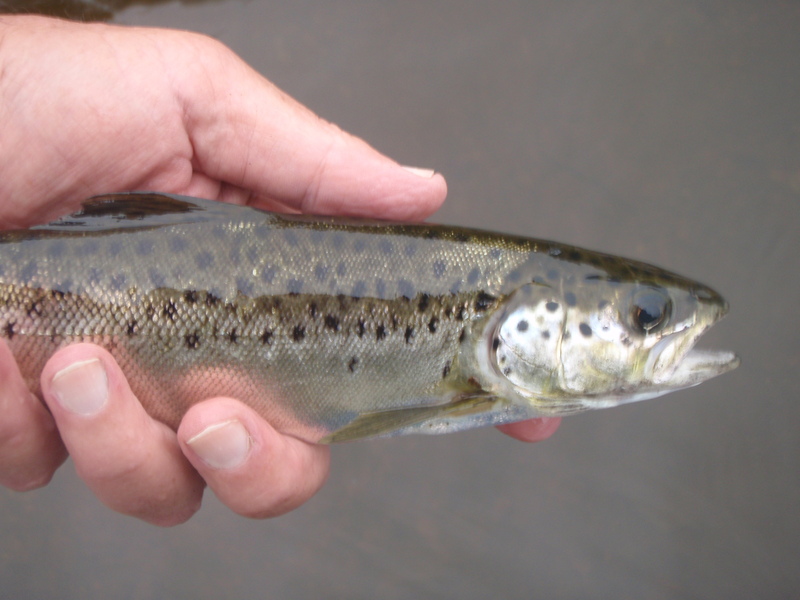 The Kennebago River has been described as the third best river in the continental U.S. for wild brook trout, after its neighboring flows, the Rapid River and Magalloway. The Kennebago was flowing low and clear on our visit in late August, but its well-known “Steep Bank Pool” was deep and challenging for the fly caster. From a distance the Steep Bank looked more suited for carp or sunfish than for wild brook trout or landlocked salmon— a quiet bend pool out beyond the sunny shallows of the river. But a rise form would dispel the illusion; the water’s depth and the steep forested banks would present a caster’s challenge of the first degree. 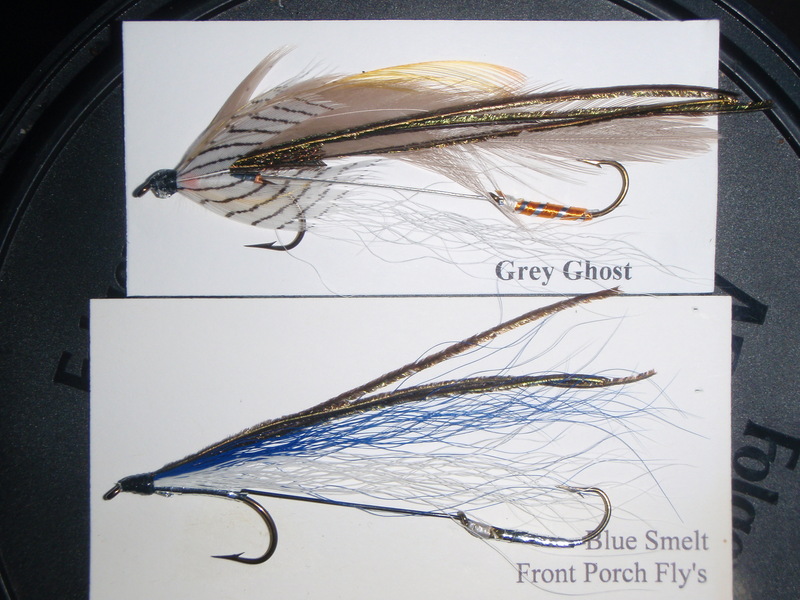 At the fly shop in Rangeley, the helpful proprietor, tying flies near the check-out counter, had suggested some ways on how to approach the Kennebago. Her suggestions for fly patterns were also interesting. 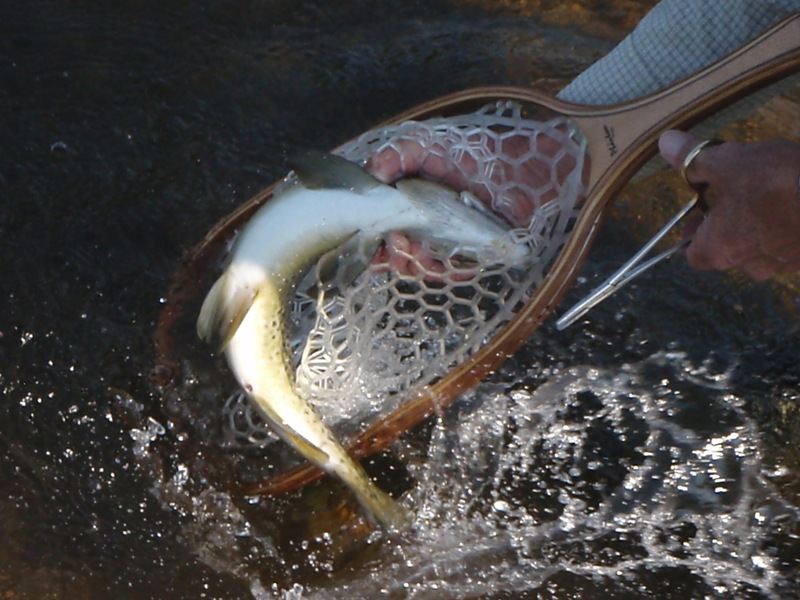 A local dry fly favorite is the old traditional Hornberg– a pattern I had known about but never cast– and it did the job for me at the Steep Bank Pool. I caught and released a brook trout and a small salmon there, but couldn’t quite reach the larger fish rising just beyond the limit of my casts. The next day on the deep Magalloway, I told another angler that I’d been the sole fisherman on the Steep Bank Pool, and he was very surprised. He said that typically the pool is “shoulder-to-shoulder” fishing and that my wife and I were really lucky to find it vacated on arrival. It was fascinating to find that the same proprietor of the Rangeley Region Sport Shop (whose first name I didn’t catch) was familiar with the new book entitled 50 Best Places, Fly Fishing the Northeast. I had written the book’s chapter on Slate Run, and her husband, Brett Damm, a Master Maine Guide, was the author of the book’s chapter on the Kennebago River. This was the first of several connections we made near Rangeley that were personal, informative and fun. 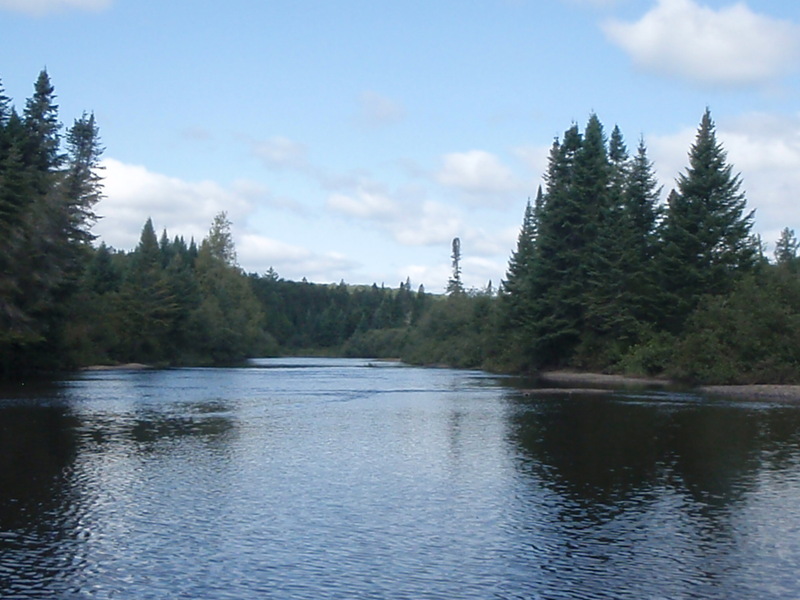 Kennebago, derived from Native Americans that inhabited the region, translates to “people of the land of sweet flowing waters.” I think we met the spirit of the region through these people as we camped near Rangeley and explored the neighboring waters. The Cascade Stream Gorge Trail is a short hike near the lake and definitely worth the time spent investigating its pools and waterfalls. Another beautiful stream, that I probably shouldn’t name, is a primary spawning stream for brook trout in the area and a tannic wonder benefitting from stream restoration work by various groups including Trout Unlimited. One day I fished it with a barbless Stimulator dry fly and the brook trout kept me busy hopping on the rocks until I tired of the action and my legs got sore. The loons and screech owls and coyotes of Rangeley Lake provided all the midnight music that a camper could ask for. 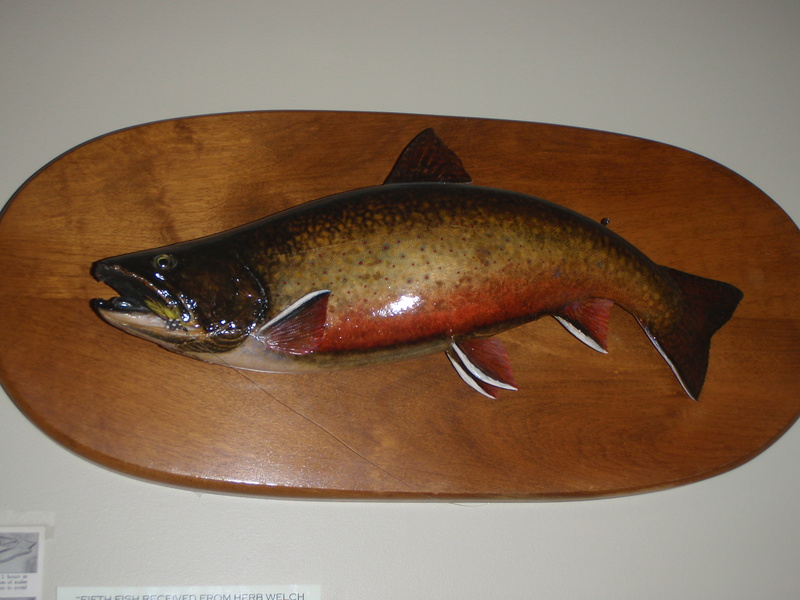 The second largest brook trout ever taken in Maine, a big 12-pounder, was caught in the lake around 1890, spurring a fishing frenzy among Bostonians and New Yorkers. 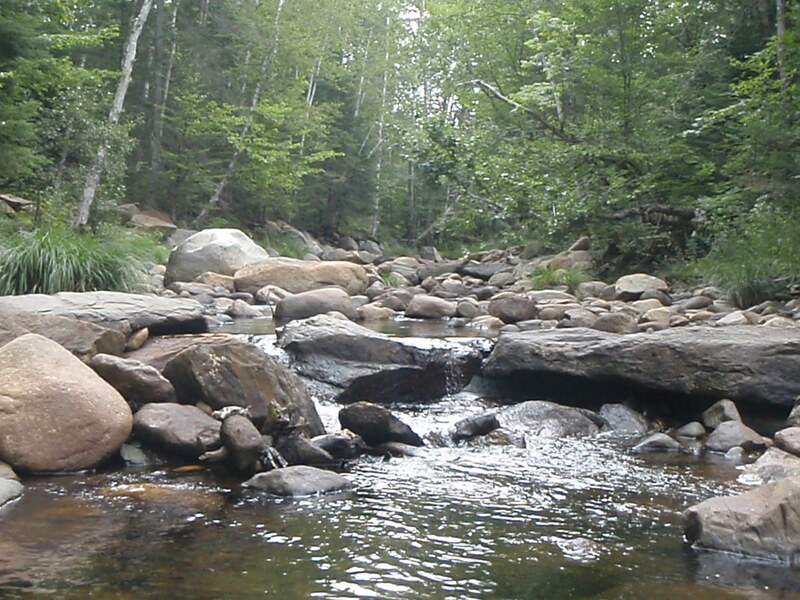 The largest brook ever caught in Maine tipped the scales at 14 pounds and was taken at nearby Mooselookmeguntic Lake (a name that only poets, madmen and moose could love). 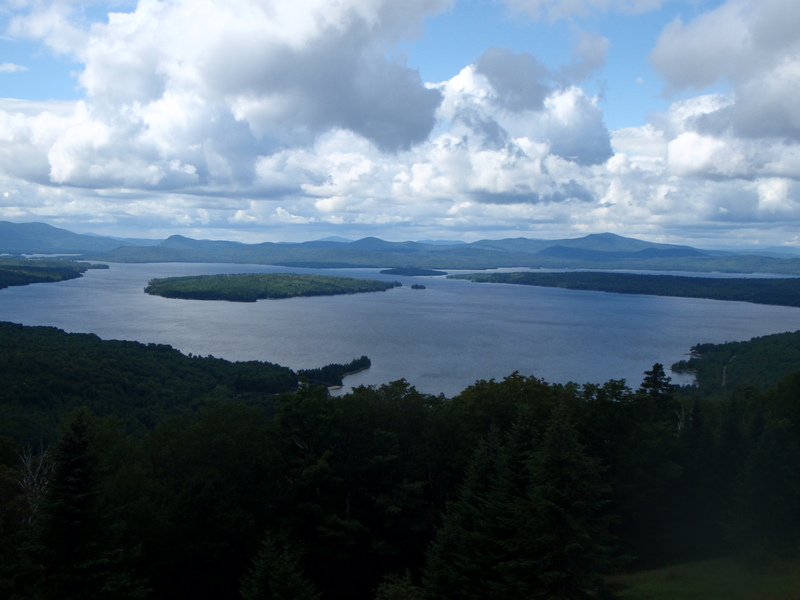 There was something of a “gold rush” to the Rangeley Lakes around the turn of the twentieth century. That gold had fins, and it swam among the sweet flowing waters. 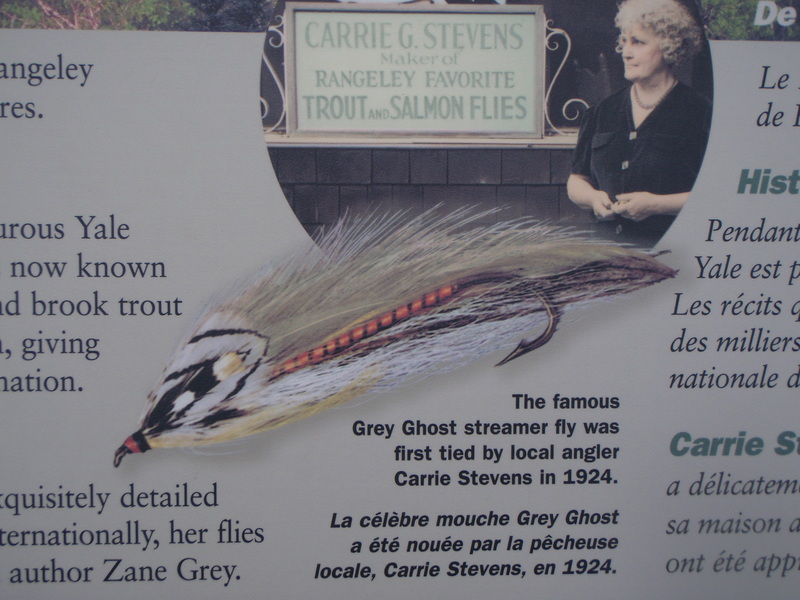 One of the most famous names in all of American fly-fishing is that of Carrie Stevens (1882-1970), who lived and worked near Rangeley. Her beautifully designed streamers, such as the Grey Ghost and Colonel Bates, gained her international acclaim and are still considered to be among the finest ever tied. 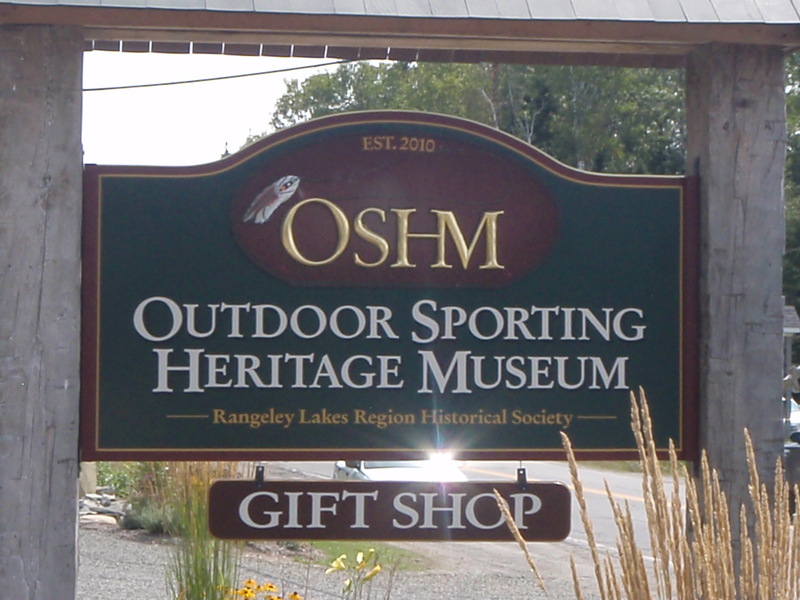 We found the ghost of Carrie Stevens at the Rangeley Outdoor Sporting Heritage Museum in Oquassic, Maine. This fabulous, interactive museum is worthy of a blogging post in itself. 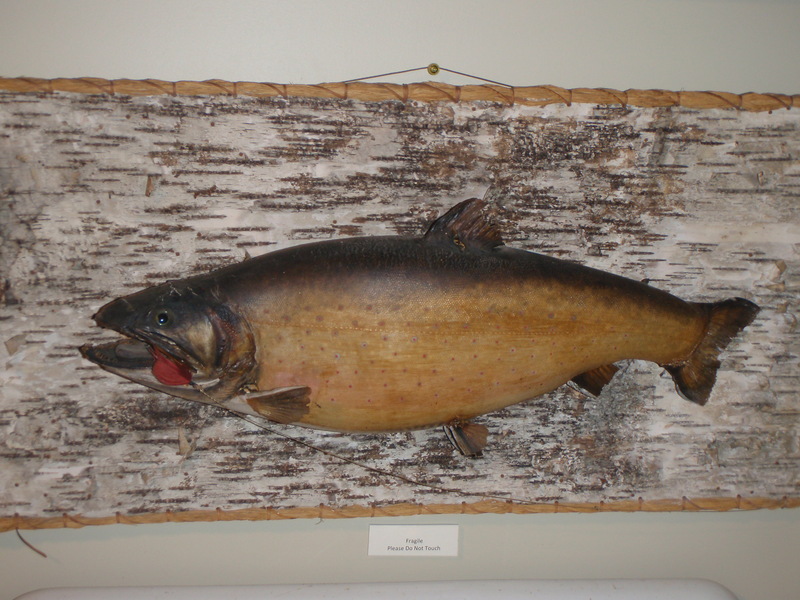 There we studied such local luminaries as Carrie Stevens, Herb Welch and Fly Rod Crosby, and got to meet and speak with bamboo rodmakers, Kathy Scott and David Van Burgel, who are also well-informed artisans of the Rangeley district. It was all so much fun that, when Leighanne and I ate lunch in a tavern across the street in Oquassic, I was sort of hovering in a timeless zone between the wonders of history and the hopes of days to come. One afternoon we visited the Magalloway River a few miles below the dam at Aziscohos Lake. 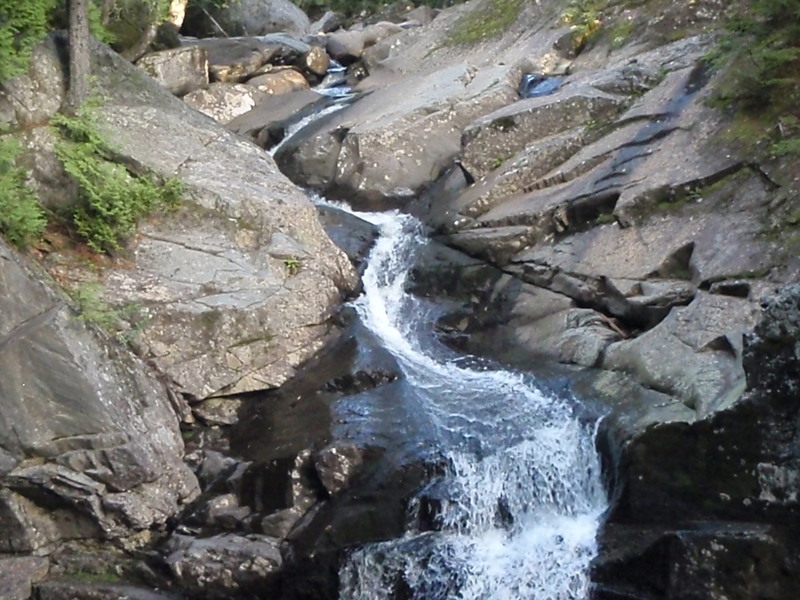 The Magalloway has been described as the number two brook trout river in the U.S., after the neighboring Rapid River (too inaccessible for this excursion). Its springtime brookies can reach 18 inches in length, but today its warm waters were much better suited for wild landlocked salmon. There we met the Maine angler, Tim Arey, and his girlfriend, who were suiting up as we arrived and who recognized the Slate Run Sportsmen cap that I was wearing. Both Tim and his partner were familiar with my neck of the woods and have a family camp near Sinnemahoning Creek in Pennsylvania. Tim and I became famous for 15 minutes on the hallowed Magalloway when we simultaneously fought our first landlocked salmon of the day. Mine had risen to a #8 Hornberg dry fly, of all things. Later that day I also photographed another new friend from Maine who expertly landed and released an 18-inch salmon and whose amiable departure thanked us for visiting and fishing in his home state of Maine. Such were the spirits and the people of the sweet flowing waters. 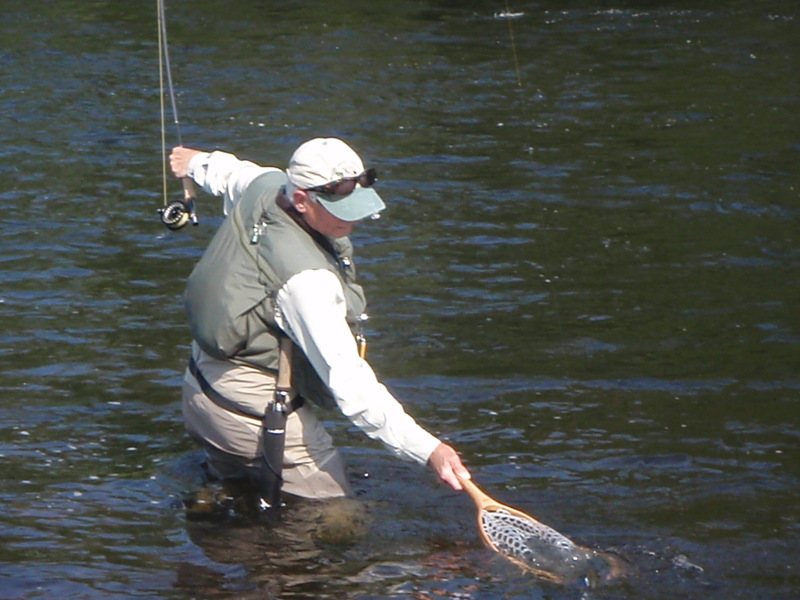 This entry was posted in Uncategorized and tagged 50 Best Places Flyfishing Northeast, bamboo rodmakers, brook trout, camping, Carrie Stevens, Hornberg, Kennebago, Kennebago River, landlocked salmon, Magalloway River, Maine Special, Rangeley, Rangeley Lake, Rangeley Outdoor Museum, Steep Bank Pool, Stimulator, vacation. Bookmark the permalink. 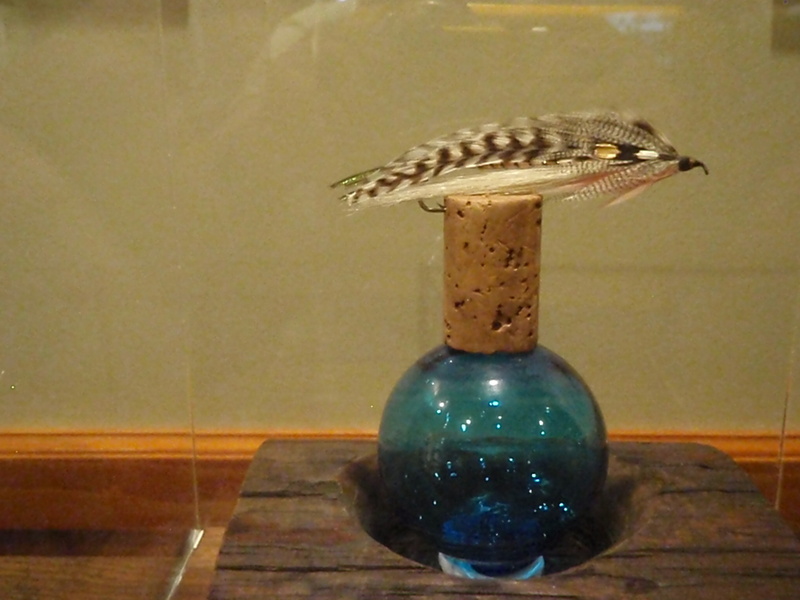 What great history into fly-fishing Walt, These 3 parts of your Maine Special have been exciting to say the least. Great job my friend. Great job indeed. I appreciate you hanging in there with me, Doug, and your willingness to understand. It’s been rewarding. The fun I had reading this! From the history, to the photographs, to your stories about friends and personalities – it was captivating. I’m not a poet, or a moose, but I loved the names of the waters you visited out there in Maine. What an adventure, and thanks for sharing! I guess I should’ve said, “a name that only poets, madmen, moose, and plaid campers can appreciate!” Thanks my friend. Again, nicely done. You always manage to stir my wanderlust with your “destination” posts! What beautiful, wild country. Did you see any wendigo? No wendigo, Bob, but once in a while the screech owl and the loon seemed otherworldly, daring me to come out of the tent then and there! We looked at this one together, and admired the pictures. What a beautiful lake and a wonderful trip that must’ve been (not that I haven’t voiced the latter sentiment several times already). Thanks guys. Maybe you’ll have to put this part of Maine on your list of gotta go-to places. You’d enjoy it. I’ll echo what Bob said, you’ve really stirred the wanderlust in me. I now know what I have been missing by not visiting there. By the way, start watching for an envelope from me and thank for the book. Thanks Howard. Much appreciated! Keep it stirring. Walt lots of memories there for me. Cascade stream, South B@@, restored stream, as well as the Height of the Land. It is a beautiful wild place. Yes, Alan, I thought you’d feel right at home with this recollection. I think I remember you writing of Cascade Stream and other places here. The SB stream full of brookies, etc. Beautiful indeed. Thanks! Thanks Bill, and one of the beauties of the sport is the deep tradition of it, plus the wealth of info to be shared. Loons, owls, and coyotes! What a wonderful midnight chorus! Beautiful scenery and great fishing. Like Alaska, if coyotes were wolves! Sort of. Thanks Mary Anne.